A black and white negative of John and Peter Perry in Whitby, Ontario. In this view John is holding on to a horse that Peter is sitting on. A dog is visible to the right of the horse. Col. John Ham Perry was born on May 5, 1892 at Whitby, the first son of John Ham Perry and Louisa Hay. He started working for the Dominion Bank in 1909 and was manager at Whitby from 1926 to 1939. In 1944 he moved to the head office in Toronto. He served in the First World War from 1914 to 1918 and reached the rank of Captain. He also received the Military Cross in the First World War. In the 1930's in served as a Captain in the Ontario Regiment and went overseas again when the Second World War broke out in 1939. He was promoted to Major in 1941, Lt. Col. in 1942 and Col. in 1943, returning home in 1944. Col. Perry served with the Canadian Armored Division in England during the Second World War. John Ham Perry married Ethel Vivian Alcock (1898-1984) on 8 July 1922 in Whitby, Ontario. They had two children: John Ham Perry (1927-1988) and Peter Joseph Alcock Perry (1936-1977). He died at Mississauga on May 30, 1976. Col. Perry is buried at Trinity Anglican Cemetery, Streetsville, Ontario. 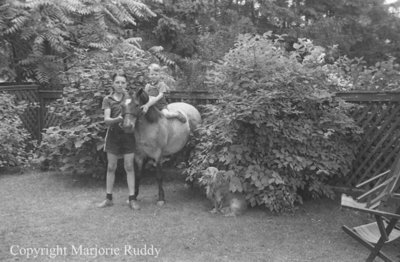 Perry Children, July 1939, Marjorie Ruddy. Whitby Archives A2013_040_815A.